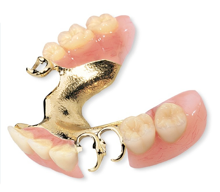 Pure Titanium Dentures can solve a few of the conventional denture problems. Pure Titanium Dentures are very thin. They are less than 1mm thin. They are extremely bio friendly. You mouth will feel it as part of your own. Making the settling down period shorter. There is no metal taste. They are very strong. Your denture will not break in halves. A Pure Titanium Framework for full dentures prices from $1,400 per frame.